It’s considered by many to be the national dish of Singapore, but this hasn’t stopped Hong Kong eateries serving their own delicious versions of Hainan chicken rice. Judd Boaz trawls the city to find the best of this signature yellow dish. While Hainan chicken is a classic cheap-eat dish, this doesn’t mean you can’t splash out a little bit more to turn it into a refined dining experience every once in a while. Making it worth the price tag, the chicken in Cafe Malacca’s version comes marinated in a sesame-based sauce which explodes with flavour and perfectly complements the fattiness of the meat. As an added bonus, the chicken comes deboned, which speeds up the process of getting it from plate to mouth. $118. 2/F, Traders Hotel, 508 Queen’s Rd W, Western District, 2213 6613. It might be sacrilegious to say this, but satay isn’t the best thing on the menu at Good Satay. 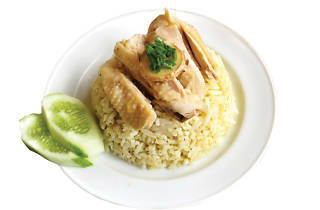 We reckon it’s their Hainan chicken rice, which comes with the yellow meat served ever-so soft and tender. The classic trio of side sauces (garlic, ginger and chilli) also each come appropriately savoury and spicy in the right places, matching the gorgeous yellow chicken and rice flawlessly. Be warned though, the chefs are liberal with the cooking oil here, so don't expect to fit this tasty lunch into any diet plans. $47. Houston Ctr, 63 Mody Rd, Tsim Sha Tsui E, 2739 9808. If you’re looking to get bang for your buck and poultry for your peso, this little shop tucked away in a Sai Wan Ho arcade is the ultimate destination for you. But don’t be fooled by the $20 per serving cost – because the diner doesn’t skimp out on quality at all, delivering succulent meat and perfectly infused rice cooked in rich chicken stock. Just be prepared for a fight, as the place is usually packed at lunchtime. $20. Shop A32B, G/F, Tai On Bldg, 57-87 Shau Kei Wan Rd, Sai Wan Ho, 6124 4718. Hainan chicken is the signature dish at the Old Town Restaurant, even getting it’s own page and introduction on the menu, so you know they take pride in their chicken. 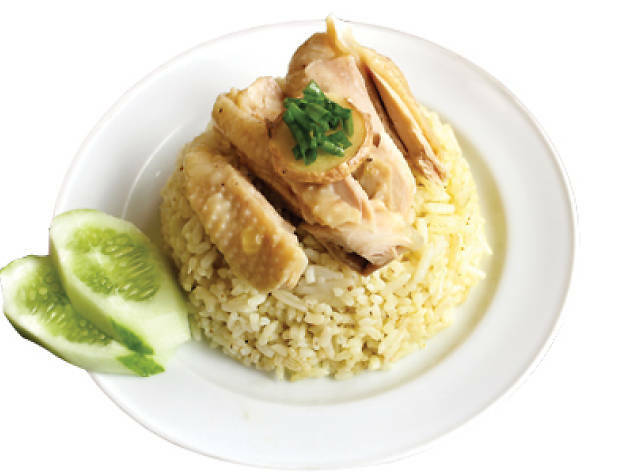 The rice is much less oily than some other places you’ll find around the city, and the chicken is deliciously lean and tender. But the real winner is the garlic sauce it's paired with, which has a hint of tangy calamansi lime to really make the flavours of this dish pop. $88. 11/F, The Loop, 33 Wellington St, Central, 2522 2009. One of the city’s most established eateries for Singaporean and Malaysian food, Satay Inn’s Hainan chicken rice comes with silky, boneless fowl that has a rich, yellow skin that comes off with little fat. The accompanying rice is a long and elegant grain with a slightly sticky texture that makes the combination a real indulgence in comfort food. $128. City Garden Hotel, 9 City Garden Rd, North Point, 2806 4938; satay-inn.com. When you walk into a restaurant and see that every other customer is eating Hainan chicken, you know you've come to a place that has the recipe down to a science. Service is quick at this little diner, with the turn around from order to mouth clocking in at around 40 seconds. The rice is a wonderful yellow hue, having been infused with flavour and colour from chicken stock. Make no mistake about it, this is a no-frills version of Hainan chicken. But who needs frills when good grub is just what it is. $52. Shop 2, 1 Wood Rd, Wan Chai, 2893 4798.